Welcome to Episode 9 of the BlueBird Podcast. Unfortunately, sections of the interview were scrambled by the recording software. I have tried to summarize what was said in the sections that were unusable. Help me fight youth homelessness this June! Earlier this year we observed first hand how easily young people can slip into homelessness and how little the Ministry of Children & Families can do to prevent this. We also had the opportunity to witness the wonderful work our local Boys and Girls Club does to fill this gap. A friend of our teenage son had been kicked out at home and after a few weeks of couch-surfing, we agreed to offer her our spare room as a temporary home to prevent her from having to sleep on the streets. The only alternative the ministry offered her was to spend nights in a shelter. This is a great alternative in some cases, but not in this one. Other than what we could do, there seemed to be no help available and the case was stuck in a bureaucratic jungle for weeks. The only help came from the local Boys and Girls Club that provided the service of their own social worker that who helped the 16-year-old girl to deal with the situation and stay in school. We were very impressed by how this organization helps fill the gap between struggling families and government services. The Boys & Girls Clubs of Canada rely on donations from the public to finance all the work they do. 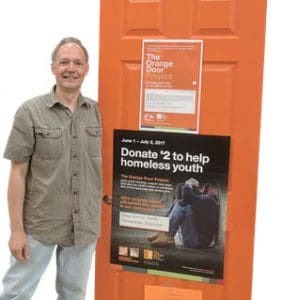 For the month of June, The Home Depot is organizing the “Orange Door Project” where customers can make a donation at the checkout and 100% of these donations go to local Boys & Girls Clubs. I have decided to support this initiative by donating $10 of any consulting hour booked in June to our local Orange Door Project. To launch this program I have created new service packages from social media training sessions to “pick my brain” sessions designed to help you improve your social media and content marketing efforts. Thank you for helping me to give young people a safe place!